First thing to do is to go to the Chamber of Commerce Visitors' Center, 1875 Massachusetts Avenue (tel 617-862-1450), just off Lexington Green near the Minuteman statue and next door to Buckman Tavern. Here you can pick up a sketch map of the town, and brochures and information on the sights. More important, you can inspect the diorama, or scale model, of the Battle Green and the events of April 19, 1775: the minutemen in their farmers' clothes scattering before the long files of crack troops dressed in brilliant colors. The diorama is well worth seeing (it's free, too). Historical accounts and explanations of the battle accompany the display. The National Park Service has organized most of the interesting historical sites in Lexington and Concord into Minuteman National Historical Park, and those with their own car can pick up the Park Service's Minute Man brochure, which has a sketch map of Battle Road and most of the sights to see. 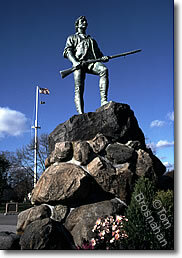 Look for the Lexington Minuteman statue: the Chamber of Commerce info office is very near it.